The lighting and controls company has added products and cloud-based software that let it tackle more and larger-scale jobs across the commercial and industrial space. Digital Lumens is one of the few companies built from the ground up to exploit the advantages of LED lighting and advanced network controls. Its first products were aimed at users of high-bay lighting: manufacturing and warehouse operations, for example. The company has now announced new products and extensions to old ones that potentially let it expand into many more niches: commercial offices, parking structures, and retail establishments such as big-box stores. It's calling the whole program Intelligence Everywhere, and it is intended to extend Digital Lumens' LightRules energy monitoring and control platform so that it is usable by enterprises with multiple sites -- and usable to control other manufacturers' lighting products, including non-LED ones. The expansion comes as Digital Lumens passes 100 million square feet (9.3 million square meters) under management, for more than a thousand customers, mostly in North America and Europe. The company just hired staff in Asia to begin exploring those markets. Clearly, its existing customer base will be the first place the company will want to look for expanded business opportunities. Below are the new components that make up Intelligence Everywhere. The cloud computing extension to LightRules is called LightRules Insight. 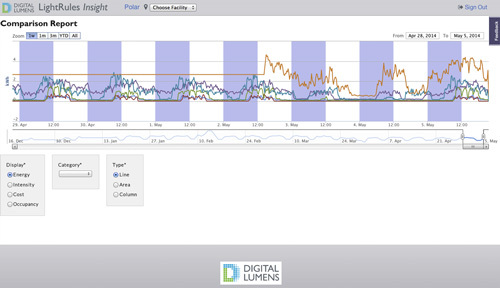 This is software accessible from any Internet-connected browser, which shows a dashboard overview of multiple Digital Lumens installations in separate facilities. The user can compare energy use patterns and history across installations. Sample comparison graph across sites from LightRules Insight. Click to open a larger version. I was told that at this time Digital Lumens spins up a new cloud server instance for each customer. It may not be the most optimized architecture, but it has advantages in security and certainly in time to implement. A company spokesman did not say which cloud supplier it uses, but my money would be on Amazon Web Services. When I see the software demonstrated in a couple of weeks at Lightfair, I will probe questions of redundancy and availability. Cloud computing is wonderful when it is available, but history shows that, even for the largest suppliers, single points of failure -- usually unanticipated -- can cause outages lasting hours to days. How are the lights controlled during such an eventuality? In the first move beyond its high-bay origins, Digital Lumens has introduced LED tube lighting. Two models are available, both 4 feet long: the LLE-3 at 3,000 lumens and the LLE-6 at 6,000. Both come in a choice of 4,000 K or 5,000 K CCT and have an efficacy of 100 lm/W. CRI has not been announced, but I presume it will turn out to be 80. A spokesman I interviewed didn't know offhand the beam dispersion angle. The LLE tubes are controllable singly or in groups (for example, an entire row in a retail setting). Sensors can include those for temperature, occupancy, and ambient light; the lights can be dimmed down to 0%. Unlike LED tubes recently announced by Philips and Cree, the LLEs from Digital Lumens aren't plug-and-play with existing ballasts and infrastructure. They will require more labor in installation, but gain efficiency by not carrying along legacy ballasts with their attendant losses. The last of the new announcements, DLAs bring non-Digital Lumens lighting under LightRules control. The press release calls them "a suite of standalone products that provide control over any fixture -- LED or legacy -- or group of fixtures." DLAs come as fixture- and circuit-level adaptors; and standalone, integrated, and recessed sensors, as shown in the illustration above right. They sense ambient light, occupancy, and temperature; meter energy; and facilitate full-range dimming (the existing light fixture must be capable of dimming via a 0-10 V signal). The Intelligence Everywhere initiative clearly has room to fill out the pieces and sand the rough edges, but in my opinion it positions Digital Lumens as a solid leader in networked lighting as we close in on Lightfair 2014.